I hope readers don't mind, but I'm diverging a bit from my usual today, because a) I spent way too much time on this article and b) I'm actually running out of ways to say the same thing over and over regarding the intermediate outlook. The market outlook remains essentially unchanged on an intermediate basis -- it's still watch and wait at the pivotal 1600 +/- zone. So today, I'm going to embark on a more overarching economic commentary. The U.S. Government made big headlines recently by announcing it will pay down a portion ($35 billion) of the national debt this quarter, the first such pay-down in six years. $35 billion sounds like a lot, until you consider that the national debt has been increasing by an average of $3.83 billion every single day since September 2007. I guess we're making progress by reversing about 9 days of the past 2,000+ days of debt, but that means we're still left with... let's see, carry the zero... 2,000+ days of debt to go! If Uncle Sam can maintain this strict level of discipline, we'll be completely paid off by the 23rd century. I maintain that our policymakers are creating a massive debt-driven bubble, and in this article I'm going to outline why I feel this is a mistake by analogizing some of the unintended consequences in depth (in "debt-th"?). 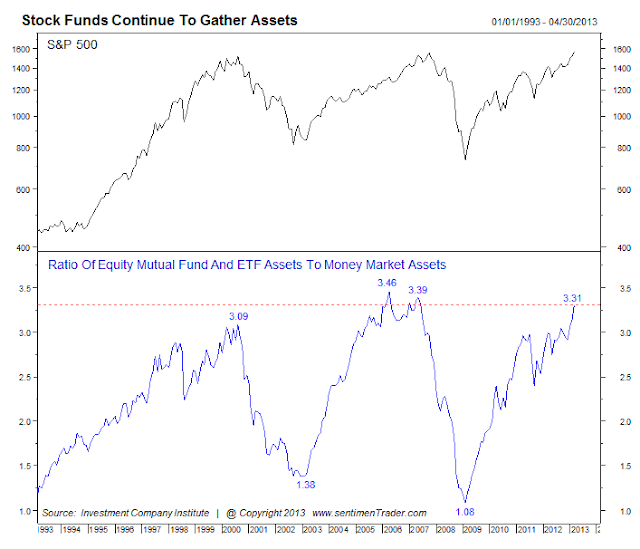 Briefly, the historical chart below is from the always-interesting Sentimentrader.com, and shows the current ratio of mutual funds and ETF assets to money market assets. The chart suggests equities are approaching the upper range of the Bubble Zone. We can see the current ratio of 3.31 has only been reached once before, in 2006-2007; and we can also see in that instance, equities continued to rise for a while afterwards -- so these types of signals can take time to work. But they're hard to ignore. As Edmund Burke said, "Those who don't know history are destined to repeat it." The Fed's stated goal with QE-Infinity is to improve the labor market -- and yesterday, new jobless claims came in at a five-year low, which undoubtedly has the Fed Governors secretly high-fiving each other in the restroom. As I see it, though, there's a problem here (beyond hygiene): they are attempting to grow our economy through debt-driven consumption. My contention is that there can be no lasting growth though this type of debt expansion. It will seem to work for a while, because the Fed's printing press is creating a liquidity boom, and that excess liquidity is driving an increase in certain asset prices. This is not unlike the way they created the housing bubble. Excess central bank liquidity sends false signals to the market -- essentially, the market sees all the extra cash floating around and incorrectly concludes that the economy is better than it actually is. To illustrate the impact of these false signals on the future economy, I'm going to draw an analogical story about a poor man who's suddenly (and erroneously) granted a big line of credit, which he begins using immediately and irresponsibly. Purely for sake of illustration in this story, let's give our hypothetical big spender a name: We'll call him "Benny B" ("B" stands for "Big spender"! I have no idea who you're thinking of here.) Benny B has no job and no assets, but he's mistakenly granted a humongous line of credit by our hypothetical credit card bank, which we'll call simply, "The U.S. Government." For a while, Benny B can use his line of credit to run around town spending like crazy. People see him cruising in his limo, dressed in his new Armani suit, and eating at the finest restaurants every night. The community naturally assumes he's rich, and in short order, Benny B gains a good reputation. Eventually, Benny B's favorite fancy restaurant even decides to extend a very large monthly tab to him. Never one to miss an opportunity, Benny B starts treating all his family and friends to dinner at this restaurant every single night. He runs up his tab higher and higher. Of course, the restaurant owner sincerely believes Benny will eventually pay his debt -- so each night after the restaurant closes, he includes Benny B's latest tab in the restaurant's asset column as "uncollected profit and revenue." And since Benny B has an abundance of "friends" nowadays, the owner notes there's an awful lot of new business coming in, night after night. He decides he needs to hire more chefs and waiters, and also begin an extensive remodel. Benny's heightened consumption is sending the restaurant false signals about the overall state of the local economy -- and with the owner now taking action based on those false signals, they have officially been sucked into the Benny B Bubble. This all seems to be working out great for everyone, for a while anyway. Benny is living high on the hog and local businesses seem to be benefitting. Even when it's time for Benny B to start paying down a portion of his debt to the restaurant, there's no crisis right away, because initially Benny can pay some of that debt with his US Government Credit Card (USGCC). By doing so, he effectively "kicks the can" on a portion of his restaurant debt straight into someone else's "uncollected profit and revenue" column. Now the restaurant and the credit card company are both inside the Benny B Bubble -- but still, neither of them know it yet. For most people, the real trouble would begin when it's time to pay off the debt they kicked over to the credit card -- but not for Benny B! He's a financial genius, so by the time the first credit card payment comes due, he's managed to finagle a loan from the -- again, purely hypothetical! -- Credit Bubble Bank of China (CBBC), which he uses to pay the interest (but not the principal) on the debt he owes to the credit card company. He's kicked the can again, and now involved yet another company in his debt scheme. The bubble grows larger. 1) He's counting Benny B's debts in his asset column. 2) He is relying on Benny's large nightly "revenue" to justify certain forward-looking expenses. Other businesses are in a similar conundrum -- for example, Benny purchased a new Ferrari on credit, and he's having a new McMansion custom-built by a small local homebuilder (via minimum down payment, of course). Due to Benny's debt-driven consumption, these other business also mistakenly think things are going better at the moment -- but they too will be hurt down the road. Without even consciously thinking in these terms, these businesses naturally assume that, somewhere up the line, Benny B is producing something, which he's exchanging for the money he will then give to them. After all, money is simply a convenient tool which stores value from one form of production to another, and thus allows us to bypass direct barter. If we remove its use as an indirect exchange of my goods/services for your goods/services, then money has no intrinsic value of its own. Benny B's money isn't coming from production (current or future) in any form at all -- in fact, Benny B lacks the ability to produce anything himself -- thus his money is, in effect, completely worthless. Still: no one in our story realizes that just yet. We could go on and on with the can-kicking (if Benny B obtained yet another loan), but for sake of time, let's bring this to conclusion here and assume the CBBC is Benny's lender of last resort. It's finally time for him to pay that loan -- except he can't, because he has no income. Thus the CBBC is the first to have Benny's bubble pop in their face. And since Benny also has no real assets, they have no choice but to write off Benny's debt completely. Soon after, the USGCC learns that Benny B had been maintaining the interest on his debt to them with that now-defunct CBBC line credit. All the money they lent to Benny is gone forever, and they too have to write off his debt. At this point, Benny B's banks are suffering, but their suffering is not immediately driven home to the local economy. That's about to change. Sadly, as Benny B's massive credit scheme falls apart, he will bring real people down with him. The restaurant owner is one of the last to learn what's been going on, and he suddenly realizes that the $250,000 line of credit he extended to Benny B will never be repaid. He sits down that night with the books, recalculating his balance sheet without that $250,000 "asset" (which just vanished back into the thin air from whence it came). He realizes he can no longer afford the restaurant's new staff, they must all be fired. Worse, he realizes he's now overcommitted on his debts, because he thought he had additional assets, and -- with the restaurant packed with Benny's friends every night -- he thought his business had reached a new permanently-high plateau. The false signals Benny B sent caused him to conclude the business was doing much better than it actually was, and much better than is actually sustainable. He checks the numbers several times, but there is no way around it. Without Benny B's nightly business, the owner realizes he is overextended to the point where he can no longer stay afloat at all. He must close the restaurant, firing everyone. Benny B's temporary "stimulation of the work force" has backfired in the end. The small local home builder, who just completed Benny's McMansion, won't go bankrupt immediately, but his future hangs on whether or not he can sell the house quickly and recoup his capital. The Ferrari dealership is able to repo the car, but it's completely thrashed and littered with empty beer cans and old beard clippings. They take a write-off. Not all of the businesses who acted on Benny B's false signals will go bankrupt -- but all will suffer to one degree or another. Every one of the businesses Benny purchased things from was producing real goods and services, so his demand for those things briefly seemed to stimulate the economy -- yet because Benny's money came from debt and not production, there was no way his spending spree could have any lasting positive impact. In fact, in the end, it hurt more than it helped. The problem is debt does not help when used as an end in itself; debt can only stimulate the economy when it is used as the means to invest in future production. If Benny had taken his loan and built a successful business, instead of simply consuming, this story would have a much different ending. The same is true of our story out here in the actual world: In the first decade of the 2000's, each dollar of new credit has produced a mere 18 cents of new GDP, which is ridiculously low from a historical standpoint (contrast that with more than 59 cents per dollar of GDP growth in the '60's), which suggests that most new debt is being used for consumption and speculation. Debt-driven consumption always backfires in the end, for the same reason it would backfire personally if you simply ran up your own debts endlessly without increasing your income. To drive this all home to our current situation: the Fed and our government are "creating" money through debt and from thin air, and this will seem to work for a time. But real money simply can’t be created from thin air, any more than we can create the tangible things money represents, like cars and houses, from thin air. The market presently believes there's more demand than there actually is, and is thus expanding accordingly (or, in some cases, shrinking slower than it normally would), which makes this a bubble. They can’t continue this debt expansion indefinitely; it must end eventually. At some point they will be forced to stop consuming, because of fiscal problems or due to rabid inflation, or due to something presently completely unforeseen -- and this whole grand economic experiment will fall apart. Exactly when the endgame arrives is anyone's guess. But when we finally reach the end of the Fed's rainbow, we'll find there's no mythical pot of gold -- only a pot full of worthless IOU's, which are redeemable for nothing. Trade safe. Good Article. The question is how long could the real economy continue to stretch. That could last Years with QE-Infinity. Exactly what I've been thinking for quite some time. The BIG question is when will the bobble pop. Obviously not today. What absolutely amazes me is how oblivious most folks are to the trouble we're in. In 2007, it took an actual missed interest payment of $92 million (AHM to Countrywide, I think) to expose the Ponzi scheme. It will take another crisis of confidence to begin the great unwind. It is coming. Another excellent post. Thank you very much for your insight. Today blew a big hole in your thesis. Here is a new thesis for you to ponder over the weekend. QE infinity has repealed all the usual technical analysis that we use. Everyone is now conditioned to BTFD because the market is minting money. If this is true or even close to being true then EW analysis and all technical analysis becomes irrelevant in such a market. Feel free to respond. Good article. But as another reader pointed out, this QE infinity seems to have thrown a wrench into technical analysis of the markets. 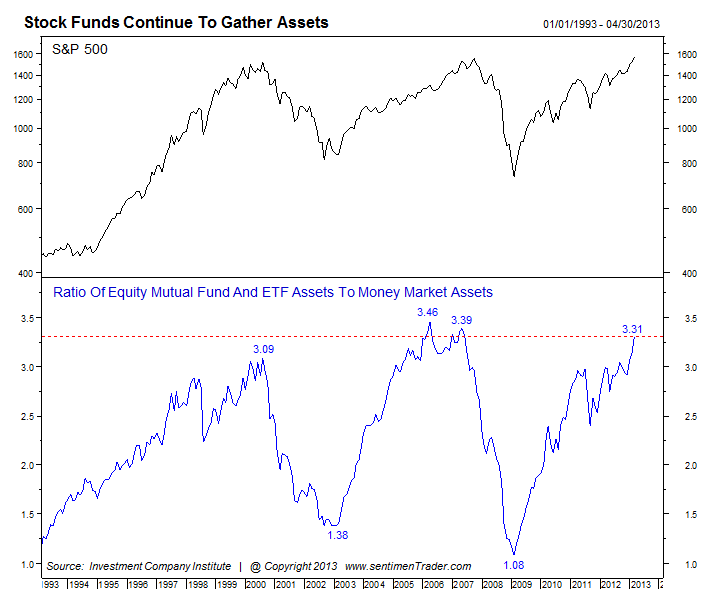 As long as money keeps pouring in, stocks will just keep rising higher. Looks like the SP500 is headed for 1680 now. Thanks for writing that, it's a very clear scenario which helps me think about the whole over-indebtedness, and how it will have to end sometime. And will help me explain it to my friends and family. I wouldn't say it's irrelevant at all -- but it's certainly much more difficult to trade counter-trend. This does appear to be the most bullish wave count possible, and it has for a while -- the mistake I made was in reading the recent signals and thinking we would get more out of the fourth wave then we did. This is where the Fed's liquidity does *skew* the signals, though -- you're absolutely right about that. Thanks Greg. That was exactly my intention, actually: to help make a very complex situation a bit more understandable. I have seen your long term charts sincr I read you every day. The peoblem with your analysis is that you and all EW proponents have alternative charts.This allows you to say what you just said to me. Here is what you just said. "I didn't actually get it wrong because it fits an exactly opposite theory that I offer as an alternative. Thus, I am never wrong because I always have a parallel theory running to explain any error". That is the beauty of EW. When you are wrong you just switch to the alternative theory...and you don't realize that you are doing it. Maybe, you should just admit, I got it wrong and I will try and do better next time. That way you can be honest with your readers and yourself. First off, the LT count shown IS the preferred count, not the alternate. Even says so right on the chart. Second, I admitted I had the recent outlook incorrect -- in most cultures, starting off a sentence with "My mistake was..." qualifies as an admission of a mistake. In case you missed that one, I wrote "the mistake I made was..." in another sentence as well. Your reply suggests you didn't actually read what I wrote. Apparently you expected me to say something else. More likely, you were hoping I would say something which would back up your prepared agenda about "the problem... is the alternative charts" and "that way you can say 'I didn't actually get it wrong'" -- completely ignoring the fact that the chart was NOT the alternate, and further ignoring the fact that I admitted TWICE that I got it wrong. Asking questions are actually nice thing if you are not understanding something entirely, however this paragraph gives pleasant understanding yet.